American terms are given below in green. If you're interested in the colours I used, all the information is at the bottom of the post. 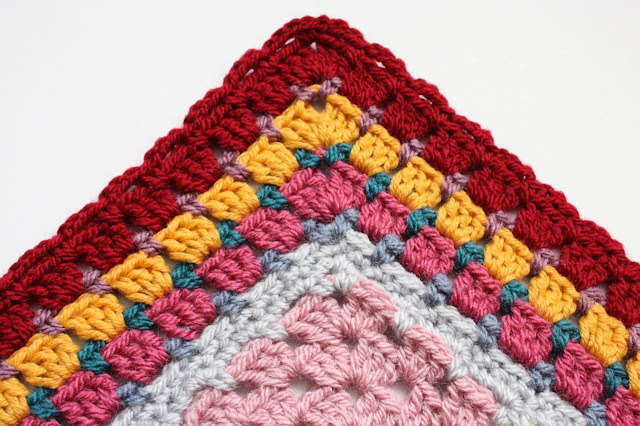 You can use this border pattern on any blanket which uses traditional granny squares, or even a large granny blanket. For this little tutorial I made up a teeny tiny sample of my Giant Grannie Patches blanket. 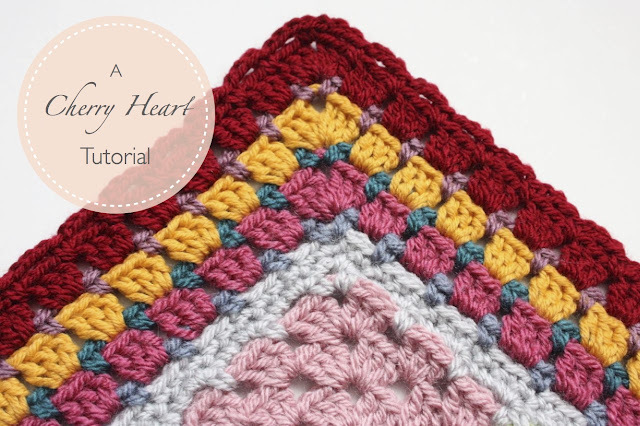 Attach new yarn colour to any of the chain spaces along the side of the blanket and chain 1. Make a double crochet into the same chain space. Make a chain of 3. Then make a double crochet into the next chain space along the blanket. Carry on in the same way, making a chain of 3 and then a double crochet into the next chain space. Until you reach a place where two squares are joined together. We're going to make a decreasing double crochet into the place where the two squares meet. To do this, put your hook into the first space, wrap yarn around the hook and pull through. Then wrap yarn around hook and pull through the three loops on the hook. Carry on chaining 3 and making double crochets (dc's) into the chain spaces, until you reach the corner space. Chain 3 and make a dc into the corner space. Then make a second dc into the corner space, to complete the corner. Then carry on chaining 3, making a dc into each ch space, and making a decreasing dc into the place where two squares meet, and working the corners as described above. Keep going until you get right around to the beginning of the blanket, then chain 3. Make a slip stitch into the top of the 1st double crochet of the round. Keep the same colour yarn and chain 1. Carry on making 3 dc's into each chain loop along the side of the blanket. Until you get to the corner. 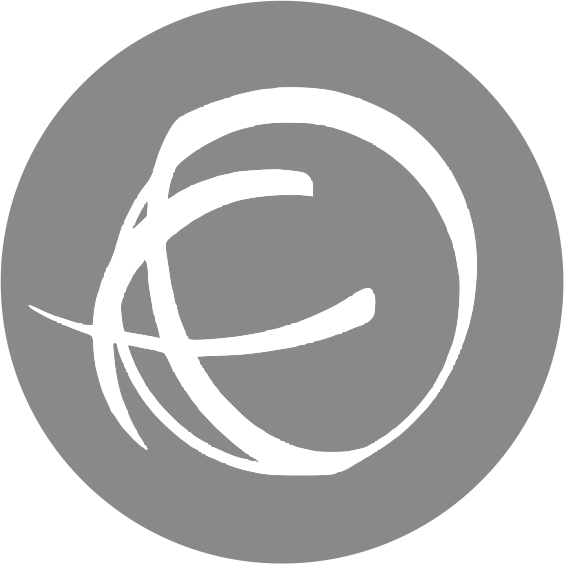 Make 1 dc into the corner loop and then chain 2. Make a second dc into the same chain loop to complete the corner. Carry on along the next side of the blanket, making 3 dc's into each chain loop as before. Work your way right round the blanket, working the sides and corners as described, until you get back to the beginning. To finish the round, make a slip stitch into the 1st dc of the round. Keep the same colour yarn, chain 1 and make a dc into the same space. Make a dc into each stitch along the edge of the blanket until you get to the corner space. Make a dc into the chain space and then chain 2. Make a second dc into the corner space to turn the corner, then carry on making dc's along the side of the blanket. Work each corner as described above and when you reach the beginning of the blanket, make a slip stitch into the 1st dc to complete the round. That completes the first part of the border. I like this slightly more solid edge to finish the blanket nicely and prepare the way for the border. Chain 1 and then make a dc into the same stitch. Then you need to skip two dc's of the round below and then make a dc into the 3rd chain. Carry on in this way, chaining 2, then making a dc into the 3rd chain along in the round below until the reach the corner. Chain 2. Make a dc into the corner space and then chain 2. Make a second dc into the corner space, then carry on chaining 2 and making dc's as described above. Work your way right around the blanket and finnish by chaining 2 and making a slip stitch into the 1st dc of the round. Attach a new colour yarn into one of the chain loops and chain 3 (This counts as a tr). Carry on along the edge of the blanket, making 3 trebles (tr's) into each chain space until you get to the corner. Make 3 tr's into the corner space, the chain 2. Make a further 3 tr's into the same corner space. Then carry on along the side of the blanket as before, making 3 tr's into each chain loop. Work your way right around the blanket, working along the sides and into the corners as described until you get back to the beginning the the blanket. To finish the round, make a slip stitch into the 3rd chain of the beginning of the round (shown by my hook in the picture on the left). Chain 1 and make a dc into the same place. Carry on in this way along the edge of the blanket, chaining 2, and making a dc between each 'Shell' until the get to the corner space. Chain 2 and make a dc into the corner space. Chain 2 again. Make a second dc into the same corner space to finish the corner. Carry on all the way round the blanket, working the edges and corners as described, until you get back around to the beginning. Then make a slip stitch into the 1st dc of the round. Now all you need to do, is keep repeating ROUND FIVE and then ROUND SIX until the border is as wide as you'd like it to be. Make sure you end on a ROUND FIVE when you are ready to finish the border. Then, keeping the same yarn colour, start working as per ROUND SIX along the edge, except make 3 chains between each dc, instead of 2. When you reach the corner, chain 3 and make a dc into the corner space as usual to start. Chain 3 and instead of making another dc into the corner space as usual, this time, just continue round the blanket, making your next dc between the first and second shell of the new round. Carry on right around your blanket in this way and to finish, make a slip stitch into the 1st dc of the round. There you have it, one very colourful, super granny-ish, Giant Patches Blanket Border.